The government of Rwanda through Rwanda Agriculture and Animal resources Board (RAB)in joint partnership with Send a cow Rwanda as stakeholder taking a lead in increasing the Jersey breed among the farmers .the jersey cows that are world-widely known to produce more milk and require less effort comparing to other dairy cows like Holstein Friesian. 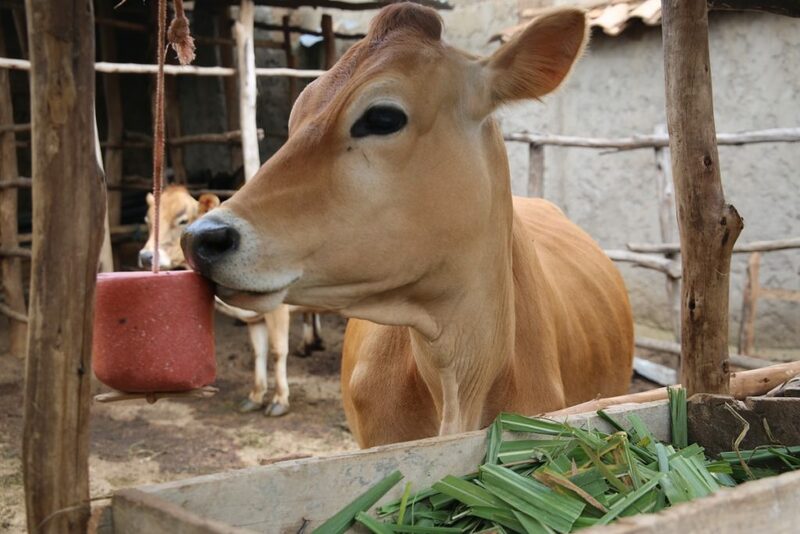 Farmers in Nyanza district of Southern province whom visited told UMUSEKE that this breed is improving livelihood as now they are getting enough and qualitative milk from Jersey cows. In addition to this they are getting money from the surplus milk to the market after consuming. In Most region of the country, you will see low number of the farmer who rear this dairy breed (Jersey) However, this is the concern of Government of Rwanda with different Partners to make awareness of this good dairy breed and Send a cow Rwanda is underpinning this by working hands in hands with RAB. However, this new species is of a great importance to the farmers as for it they produce more milk while the rate of feed and water intake is less. 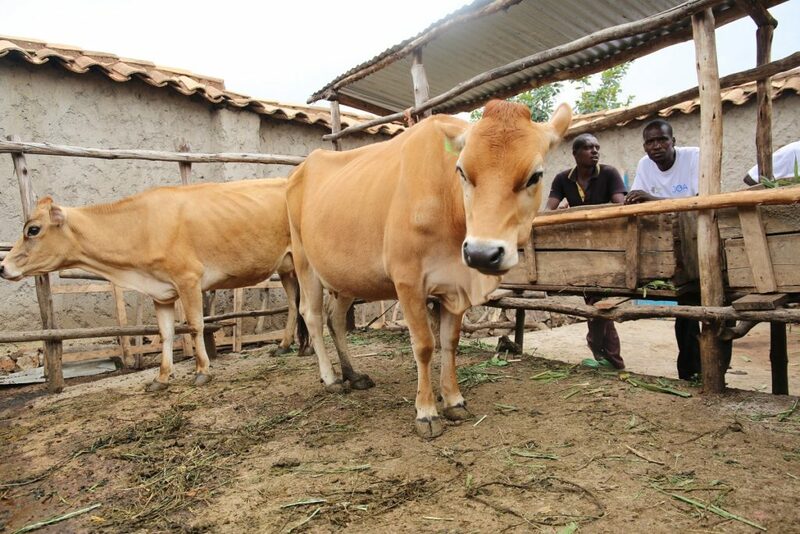 Kanyange ,being trained by Send a cow about cows management and being aware of Genetic Improvement through artificial insemination, Her livestock out changed for good and she now benefiting from the improved Intensive farming systemadopting Jersey breed a cow that give a high protein content milk. “I have been domesticating cows for 19 years. Local breed of cattle that were not producing much milk as the jersey cows do. One of the local breed produced between three to four liters of milk a day. However, the jersey cows produce more than twice bigger than the local breed cows.” Kanyange said. She said that it was difficult for to get organic fertilizer (Manure) to use in her agricultural activities. Currently she is appreciating to have acquired with skills in the new farming systemthat is providing enough organic fertilizer to help in growing the crop i.e her banana plantations. 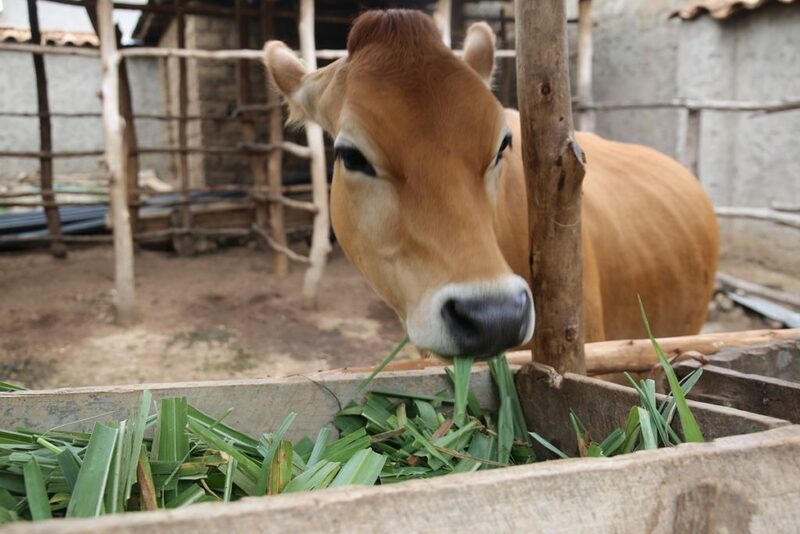 The production from both banana plantations and jersey farming provides her with at least one million Frw, a year. Among those who come learn from her include Nzaramba Innocent from Ntyazo sector. Nzaramba said that he knew how to use an artificial insemination as way to improve milk production. However Alfred Musafiri, Project facilitator, said that after regular and intensive training, farmers are currently knowledgeable on how important to adopt new intensive farming system is. We can include here: proper and efficient feeding system, Herd management and farmers should provide enough water to the cows. Building of Cattle shed and /or building good shelter is amongst the animal welfare and is a concern. The cows shed also has resting area for napping and sleeping.